I don’t even know how to start this review. I would say that “Verdure” is a “big” title, in all ways. For starters, Zimmerman’s prose is spotless and graceful. Perhaps at first, you can feel a bit dizzy due to the accurate and sensorial descriptions, but once you submerge in the scenario the author builds up for you, you see yourself surrounded and impregnated by this tale of fantasy and darkness. A big effort in sewing the stories is shown as you get into the story. Zimmerman is a perseverant investigator of the human psyche, in this case, several harsh emotions, forsaken feelings, reactions in front of abandonment, solitude and betrayal. Remnants of a spiritual gift lead our protagonist to follow the track of his intuition to protect his beloved ones from a danger everyone is oblivious to. Feeling that everything left is lost and nothing else is on the table, Edward has to follow through in a hopeless fight, with the only fuel of not having a way back. This book is a trip of introspection to our own soul, fears and traumas. The trigger that changes your life forever, when you realise… you don’t care anymore. Darkness soaks the life of the characters when a person intimately tied to the protagonist, since they share the same secret, threatens their whole existence. 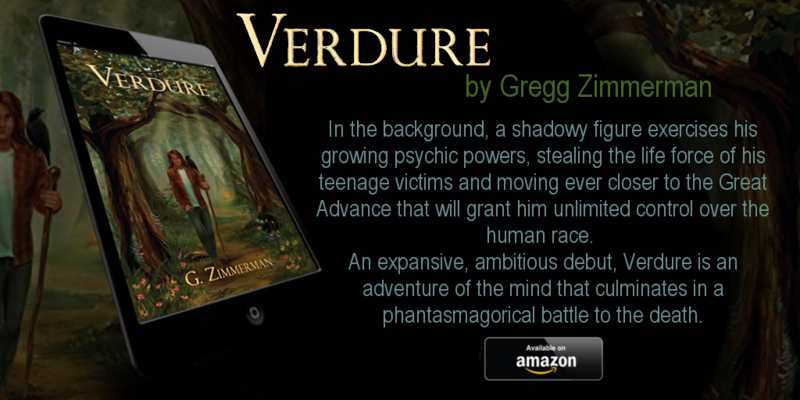 “Verdure” is a book to enjoy in all its splendour. Without any rush, every little drop of it. Fantasy and horror melt each other in an obscure tale which, I’m certain, will remain with you the rest of your days.